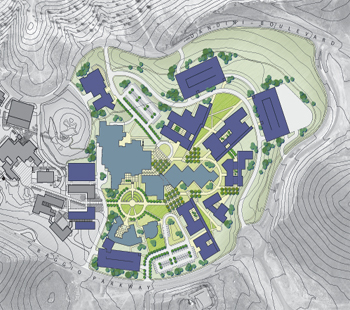 The plan establishes a physical framework to support the Truckee Meadows Community College educational mission as it addresses a growing student population in the Reno, Nevada region. 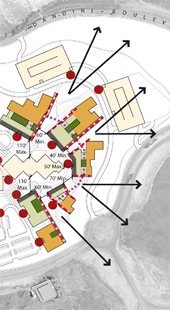 Taking into account TMCC’s satellite locations, the master plan accommodates growth at the Dandini Campus with the expansion of facilities from 398,000 to 1,084,000 gross square feet, along with parking. The master plan proposes a series of buildings interspersed with large and small spaces open to vistas beyond and incorporates protected courtyards within the structures. Building courtyards link interior circulation corridors to allow ease of access around campus and protection from undesirable weather. In addition, the master plan clarifies a cooperative development of several facilities to be shared with the neighboring Desert Research Institute (DRI). The plan sets forth guidelines based on principles of compact design to encourage human interaction and efficient and sustainable use of resources.